Designed for secondary 5 (or equivalent) students, this 4-day/3-night summer camp will revolve around a table-top exercise of a major infectious disease outbreak. Campers will get exposed to real-world global health and development (GHD) issues that arose when countries face emergencies and learn about leadership and decision-making in GHD crises. Through multiple simulation workshops, campers will be able to see that outbreaks are not just infections and patients but a complex group of many concerns and perspectives, and be tasked to apply their leadership, diplomacy, negotiation, critical thinking and analytical skills in various disaster response scenarios. A prominent line-up of international and local experts in GHD will serve as coaches and mentors for the camp and there will be ample opportunities for campers to interact with this distinguished panel. 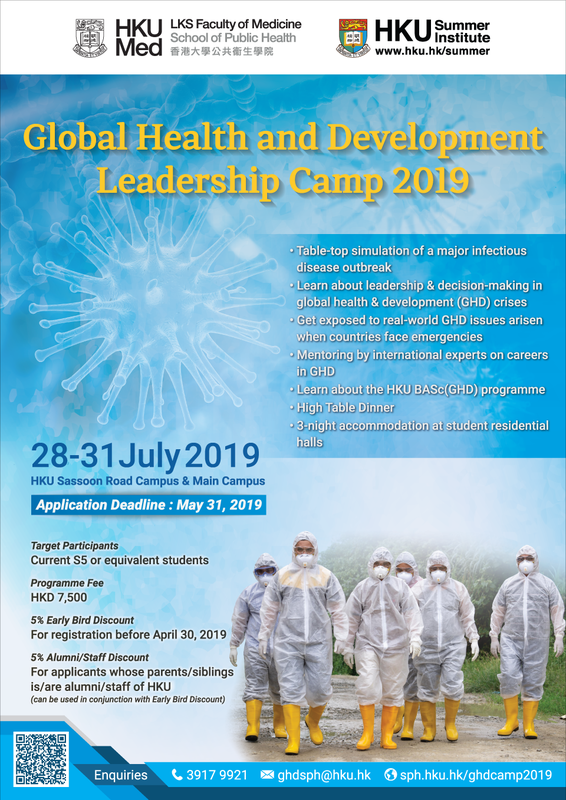 Campers will also be able to learn more about the Bachelor of Arts and Sciences in Global Health and Development [BASc(GHD)] programme (JS6250), which will be admitting its first intake of students in September 2019. The first of its kind in Asia, this interdisciplinary programme provides students with the knowledge and competencies necessary to not only succeed within today’s rapidly evolving international and interdisciplinary environment but also contribute towards solving today’s most complex GHD challenges. The camp will close with a high table dinner in the final evening of the programme.